A curved walkway created with concrete pavers, installation by Lawrence Concrete Design. 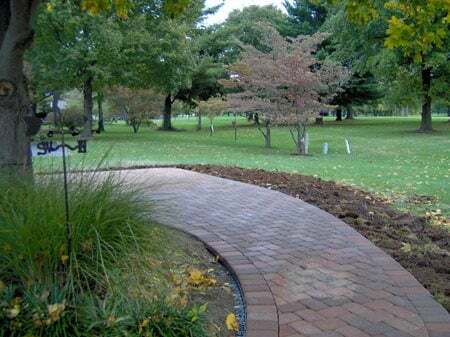 BenefitsIf you want a sidewalk with greater curb appeal than the typical narrow, straight-sided walkway, concrete pavers give you the versatility to form walkways with gentle curved configurations and make them any width you desire. They also allow you to replicate the traditional look of a natural stone or brick walkway, but come in a wider array of colors and shapes. “Concrete pavers are both versatile and long lasting. They fit beautifully into many different types of home landscapes and add value to the home,” says Jean Henry of Lawrence Concrete Design, Louisville, Ky.
One of the drawbacks of pavers is the cost, which tends to be higher than decorative poured-in-place concrete. “Natural stone is one of the most costly hardscape choices, followed by pavers and stamped concrete,” says Henry. “Exposed aggregate and regular concrete are some of the most economic hardscape choices.” Unlike poured-in-place concrete, however, concrete pavers can be walked on immediately after installation. MaintenancePaver sidewalks require minimal maintenance if they are protected with a good sealer and the joints are filled with a polymer sand, which contains a special polymeric additive that binds and hardens the sand and helps to prevent erosion. The only regular maintenance required is sweeping and occasional rinsing to remove dirt and leaves. Concrete pavers may settle in spots over time if they aren’t installed properly over a stable subbase (see installation tips below). However, they can easily be reset with no noticeable patchwork. Simply remove the affected pavers, regrade and recompact the subbase, and reinstall the pavers. In the winter, paver sidewalks can be shoveled without dislodgement because most pavers have chamfered edges and joints. However, don’t use sharp objects to chop ice, which can damage the pavers. Instead, add traction with sand or cat litter or apply a noncorrosive deicer, such as calcium magnesium acetate. Avoid the use of sodium chloride (rock salt) and calcium chloride, which can harm the pavers and cause efflorescence. The use of darker colored pavers for sidewalks will help to melt snow faster and hide stains. Avoid choosing a paver shape and pattern that will require a lot of cutting to fit your space, which can increase installation costs. To accommodate average foot traffic, avoid narrow walkway configurations. Allow for widths of at least 3 feet.